Welcome to your Senior Year! Your final year as a Panther will be filled with challenging courses, amazing events and perhaps even a celebration or two. Before you know it, you will be joining your classmates for end of year awards and commencement ceremonies. To help you navigate through this busy time, we've compiled some links and information below. Check back often to see which exciting events and important deadlines are around the corner. CEER is a long-standing Chapman University tradition. All undergraduates receive a free yearbook, please contact Colleen Wood (cwood@chapman.edu) to receive your copy. Senior portraits for the yearbook must be taken by the official university yearbook portrait photographer. Click here for more information on the CEER Yearbook and scheduling your Senior Portrait. The Chapman Ring was designed by a team of students representing disciplines from across campus and included undergraduate and graduate voices. The Chapman Ring collection represents a connection to not just your time at Chapman, but to the alumni who walked these halls before you, and to future generations of Panthers. 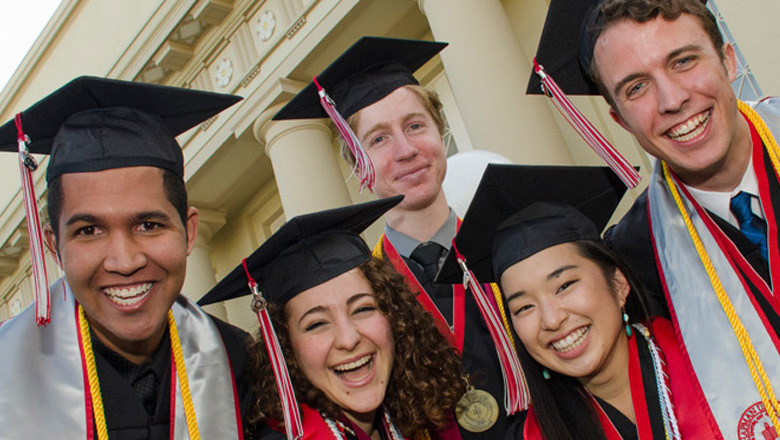 To change your conferral term, please email conferral@chapman.edu. Degrees are conferred at the end of January, May and August. There is no fee for degree conferral. The preferred deadline for degree conferral submission is January 15. You will not get email information regarding Commencement until your degree conferral application has been submitted. For more information, visit Office of the University Registrar website. Once your degree is conferred, you will receive a confirmation email stating your degree has been awarded. You can expect your diploma to arrive within 4-6 weeks from the date of the email, pending there are no holds on your account. All holds must be resolved before your diploma can be released. Please contact the department that placed the hold on your account if you have any questions. Minors and emphases are not listed on the diploma. However, they are listed on official transcripts. Latin Honors are listed on the diploma. See the catalog for Latin Honors requirements. Commencement ceremonies for the Class of 2019 will take place during the weekend of May 17-19, 2019. For a detailed schedule and more information, visit the Commencement website. The College Senior Survey (CSS), a survey administered to Chapman University graduating seniors every year, is part of a national study of college seniors conducted by the Higher Education Research Institute (HERI) at UCLA. The data gathered from the CSS helps Chapman identify areas where it is excelling and provides an opportunity to identify areas for improvement. A summary report is reviewed by Chapman’s senior staff every year. An email, from Provost Glenn Pfeiffer, with the survey link was sent to graduating seniors on Monday, April 9. If you did not complete the survey, keep an eye out for reminder emails with the survey link on April 20, May 2 and May 9. If you have any questions about the survey, feel free to contact Dr. Marisol Arredondo Samson, Director of Institutional Research, at arredond@chapman.edu. The survey is scheduled to close on Tuesday, May 15 so please take the time to complete the survey as soon as possible. Thank you. It's everyone's favorite question to ask a college senior: What are you going to do after graduation? Here to help you find that answer is Chapman's Career and Professional Development! Whether you stop by to ask a quick question during walk-in hours, or attend one of their networking events, they have the resources you need to guide you on your way. For upcoming events, check out their Facebook Page. For more information on their resources, visit Career and Professional Development. UPB has had the pleasure of planning Senior Week for the past few years. We want to help Seniors create more memories before they bid farewell to Chapman with different events each day! In the past some of our events included: Dave & Buster's, Taco Night at the D a trip to the Wine Lab and more! Dates for Senior Week 2019 will be announced soon. We hope you are excited and we cannot wait to see you there! "Senior Legacy unites seniors through engaging experiences and instills a lifelong commitment to Chapman University that impacts future student opportunities." Senior Legacy is a long-standing Chapman tradition for the senior class to present the University with a gift as a way to commemorate their time at Chapman and support future generations of Panthers. The Class of 2019 has decided for their class gift to be in the form of merit-based scholarships for students. Be on the lookout for Senior Legacy events happening throughout the year and leave your legacy by supporting future Panthers! For more information, please visit the Senior Legacy Webpage.